Very interesting! I assume it's all in Japanese -- wait, you said it would help you in translating, so maybe not! Well, I can go look for it at the Kinokuniya Bookstore in San Francisco. Hi! So nice to hear from you. Yep, this is written in English. But I heard that it is not going to be available until November this year in the U.S. Here is some info. on this book on Amazon.com (not Amazon Japan). Mmmm... looks like you can buy it cheaper over there. I am in Mongolia right now,(I left my book at home) it is in the midst of a tourist frenzy like I have never seen before, No hotel rooms at any price, I think I found an apartment to rent from tomorrow, though. I'm going back to my room and drink a big glass of airag, fermented mare's milk and then take a nap. No, I would never want to deal with hamo. That’s too crazy for me. So you are in Mongolia now??? Wow, how exciting!! Hope you found a nice place to stay. I’ve heard about fermented mare’s milk. It’s pretty strong, isn’t it? Oh, come on, you are too modest. Hi Obachan - Looks like a excellent book. I've pre-ordered it. 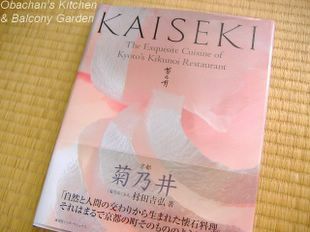 Hi Oba-chan, I want this book, it sounds wonderful! Love all your other recent treats, the chiffon cake, jam, etc. And I LOVE edamame, thanks for the tips! BTW - Obachan and Keiko - you guys write far from Engrish! Much better than most of us other bloggers!